This non-smoking hotel scores high marks with our guests for its complimentary high-speed internet access free breakfast heated indoor pool convenient location and complimentary parking. 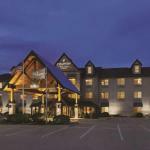 The Country Inn and Suites by Carlson Green Bay North has 63 rooms spread across three floors. All accommodations feature free high-speed internet access 32-inch cable TVs comfortable beds microwaves refrigerators sofa beds free local and long distance calls complimentary newspapers and coffeemakers. The hotel has an indoor pool hot tub 24-hour business center guest laundry fitness room meeting space and 24-hour front desk. Express check-in/check-out and laundry/valet services are available. In the morning guests can start the day with a complimentary deluxe buffet breakfast that includes fresh fruits hot and cold cereals eggs waffles and assorted juices. Parking is free. Country Inn and Suites is adjacent to the Pro Bowl Recreation Center. Within nine miles of the hotel guests will find Lambeau Field NEW Zoo Bay Beach Amusement Park Green Bay Botanical Gardens and Oneida Bingo and Casino. Austin Straubel International Airport is 15 miles away.